It's the middle of the Depression, and ten-year-old Bud has run away from his foster home to go search for the father he has never actually known. He thinks his father is the jazz musician that he saw on some posters his mother had saved, so he sets out to find him. He faces danger, violence, comedy, but mostly kindness. Booklist said this book has a "rich blend of tall tale, slapstick, sorrow, and sweetness [that] has the wry, teasing warmth of family folklore. " The reading level for this book is perfect for the intended audience (grades 5-7). Kids generally read books written on this reading level (see left) around the middle of 5th grade, so most children will have no problem reading this book independently. Although....it would also make for a great read-aloud during your American History units time. If you are giving this book to younger kids or kids at the start of 5th grade, you will need to provide added support or read the book together. There are several different book covers available for this book. We love them all! There are quiet a number of novel units (lesson/activity packets) available for Bud, Not Buddy on the popular teacher website teacherspayteachers.com. We haven't personally used them with our classes because we teach the younger grades, but they all seem to have a lot of positive reviews. (If you aren't familiar with this site, it's full of lesson plans, activities, learning games, and other curriculum materials made by teachers. We LOVE the site!!). 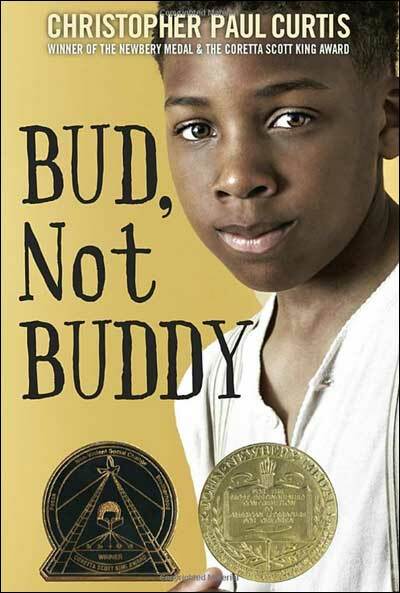 To see these Bud, Not Buddy novel units, click the link or the pictures below.